Chandigarh 31st August:- US Hospitality chain G6 Hospitality LLC and India's Auromatrix Holdings have announced opening of G6's first property 'Hotel 6' in India at Zirakpur. 'Hotel 6' Chandigarh, Zirakpur, is a 175 room modern & vibrant hotel spread over 6 floors, that offers a completely distinctive & unique guest experience. It is noteworthy that 'Hotel 6' was ranked as one of the ten top hotel companies in the USA in 2015. The details of the formal launch of 'Hotel 6' were shared with media by the top management from both the companies. Kumar Sitaraman, Chairman, Auromatrix Holdings, Rob Palleschi, CEO, G6 Hospitality LLC, USA ,Mike McGeehan, CDO, G6 Hospitality LLC, USA interacted with the media at the Hotel, which has been established at a prominent location along the NH-22(Chandigarh -Ambala) in Zirakpur. Kumar Sitaraman, Chairman, Auromatrix Holdings, said that in January 2017, Auromatrix entered into a development partnership with G6 for India. As an outcome of the partnership, Auromatrix has unveiled the first Hotel property in India, the 'Hotel 6' Chandigarh, Zirakpur. Plans are on to open forward-looking 'Hotel 6' properties at Tier I, II and emerging cities across India. The India partnership aims to add 30-40 G6 hotels in a period of 5 years. Rob Palleschi, CEO, G6 Hospitality LLC, USA said that Hotel 6 is a brand of the US based G6 Hospitality LLC. G6 Hospitality LLC owns 3 iconic American brands – Motel 6, Studio 6 and Hotel 6. The first Motel 6 was opened to public in 1962 in Santa Barbara, California. Since then, the company has grown in the regions of USA & Canada and today, their portfolio comprises of around 1,600 hotels across USA, Canada and Mexico. The Hotel 6 brand was launched by G6 for International markets and is undergoing development in Latin America, and now in India. Mike McGeehan, CDO, G6 Hospitality LLC, USA, said that Hotel 6 is an upmarket brand providing all modern facilities & amenities to address living guest needs. The brand is well supported by a global marketing network and regional sales teams at various locations in India. Hotel 6 would be an upscale/upper midscale brand in India. Motel 6 and Studio 6 would classify as a midscale/lower midscale brands. The Hotel's USP is use of technology to achieve customer delight. The property is using a special & state-of-the art & exclusive to Hotel 6, cloud based software 'Hotel Key'. Guests will be able to use I-Pads for check in & check out, ordering food in the restaurant etc. Dot.Yum is the All Day Dining Restaurant & Altitude is the Bar set up at Hotel 6. The Multi-cuisine recipes have been intelligently tweaked to suit local flavours. As an example Chinese cuisine is available with a Punjabi touch, as original Chinese is a little bland. One can choose between authentic Indian, Continental, Lebanese & Mexican food available. Hotel 6 has City View and Pool View rooms with king and twin queen size bed options. 5 luxury suites are available, including accessible rooms for the differently abled. The rooms are designed in a modern and spacious style. The colourful and contemporary interiors give a refreshing feel to the hotel. The ground floor features facilities like a Banquet Hall - Hub, Meeting Spaces- Platinum I & II, a Swimming Pool & a fully equipped Gym. The hotel is situated close to the existing commercial hubs of Rajiv Gandhi IT Park, Industrial Area-I and II in Chandigarh and Sector-67 in Mohali. The strategic location of the hotel is aimed at tapping into the growing demand of business travellers to Chandigarh as well as leisure travellers/transit travellers who are looking for shorter stays. Zirakpur also happens to be a major transit point for tourists visiting Manali and Shimla. Chandigarh 30th August:- Dr. Ambedkar Institute of Hotel Management, an autonomous body under Ministry of Tourism, Govt of India, organized a Blood Donation Camp on 30th august, in alliance with alliance with Post Graduate Institute of Medical Education and Research (PGIMER), Chandigarh. The Institute organizes Blood Donation Camp on an annual basis, in which the students and staff members enthusiastically participate for the virtuous cause. Many students appeared to be passionately waiting for donating blood. The event was a massive success with 143 units of blood collected for the noble cause. Arvind Varma, Principal In-charge of the Institute, said that blood donation is one among the most humane and pure activities that a person can be a part of. Everyone should know the importance of this vital cause and hence contribute significantly for the greater good of the society. He also appreciated and encouraged the students and staff members who donated blood. The donors went through a round of medical check-up before donating blood and were given memento, refreshment and a certificate of recognition for their generous service towards the society. Chandigarh 30th August:- A Mega NRI Convention is being organized in Chandigarh this year. The Indus Canada Foundation is organizing this convention on the occasion of 550th Jayanti of Nankana Sahib. Chairman of Indus Canada Foundation Gurinder Sodhi and President Vikram Bajwa announced the program in a joint press conference. They said that the upcoming NRI Convention will be held from December 15 to December 19. 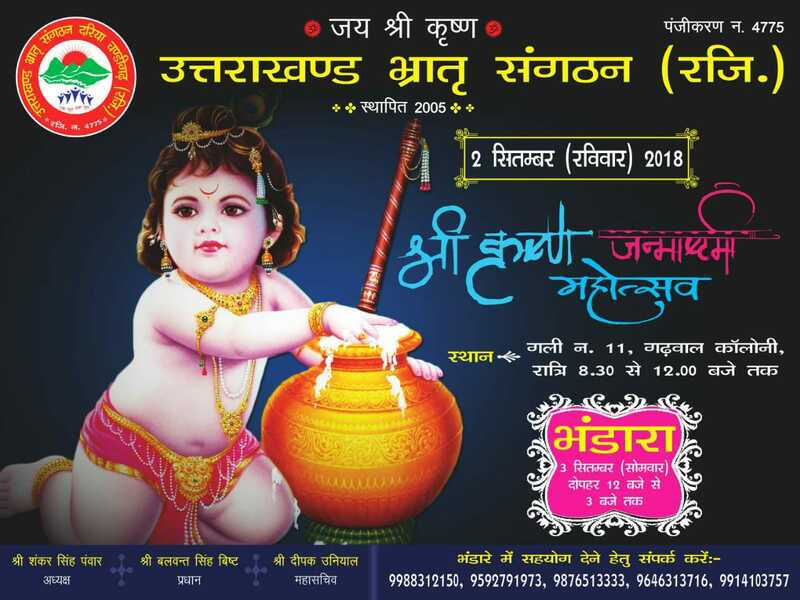 The inauguration of this event will be held in Chandigarh. Vikram Bajwa said that Nankana Sahib Hockey competition will be organized in Shahabad of Haryana, Ludhiana, Jalandhar and Amritsar of Punjab. For this, there will be Pakistan Punjab XI and India Punjab XI teams competing against each other. They said that Union External Affair Minister Sushma Swaraj, Punjab Chief Minister Capt. Amarinder Singh and Haryana Chief Minister Manohar Lal Khattar have been invited to inaugurate the NRI Convention in Chandigarh. On December 19, at the closing ceremony of the convention in Amritsar, Union Information and Sports Minister, Vijay Vardhan Rathore has been invited. He will present the prizes to the hockey teams. Both of them appreciated the efforts of both governments for opening Kartar Pur Border for Nankana Sahib and said that this will strengthen the relations between the two countries. About 2000 NRIs will take part in the Mega NRI Convention this year. Chandigarh 30th August:- Eco chic Beauty, organic skincare and vegan makeovers swirl together as owner of Cleopatra's chain of salons and makeovers, Richa Aggarwal launched luxury Bridal lounge and green salon in Sector 44 Chandigarh . Brand new place from the portfolio of Cleopatra is wrapped in rainbow of green and organic silhouette and the launch further strengthens and enhances Cleopatra's pledge towards blending organic and green refinery in beauty practices. New hub of beauty is launched on the concept of luxury immersion through green makeovers. Cleopatra remains dedicated to lift lid from Natural, organic and eco friendly beauty applications and rituals that are designed by infusing luxury . One of its kinds new hub of organic beauty will provide premium beauty and spa experience to tricity. Celebrating the occasion Richa Aggarwal stated that Amalgamation of luxury and wellness are the best ways to describe Cleopatra's recently launched spa and salon in its new avtaar. Occasion also saw soothing and refreshing makeups done with organic palate while amalgamating contemporary trends. 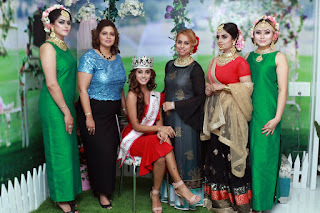 Gracing the occasion Miss India Anukreethy stated that luxury beauty services mean elegant and sophisticated artistry that combines to achieve optimum results in premium set up and Cleopatra fits the bill so perfectly. Appreciating the ambiance Anukreethy further said that she is in awe of makeovers done by Cleopatra and feel extremely rejuvenated here, aura of the place is soothing and comforting and touch of green is extremely refreshing, it seems you are getting pampered and transformed in the lap of nature under beautiful sky. The place beautifully combines classic and elegant style with warm and inviting atmosphere and offers elevated beauty experience by raising standards of premium services. As you enter you can feel the spirit of happy spring all over the place with splendid green aura. Colours are earthy and place surrenders to serenity to offer a soothing array of holistic therapies for complete harmony of mind , body and soul. luxury bridal finery from Cleopatra will offer pristine runway looks and a complete menu of bespoke makeovers for different occasions that remain prestigious.Time honored treatments are combined with wellness concepts and set new benchmark. Richa Aggarwal said that we pledge to lighten environmental footprint that leads to accomplish our "Go Green & Earthy Drive". Eco friendly beauty ethos kick started by Cleopatra are set to make positive progression in everyone's life. She added further that we at Cleopatra will discourage use of plastic packaging, toxic chemicals ridden beauty products and support sustainable plant derived ingredients.We are dedicated towards our initiatives to propel Eco friendly formulas by following environment friendly ethos and cruelty free beauty practices. Chandigarh 30th August:- In yet another industry first, Bharti Airtel ("Airtel") today launched affordable international roaming voice packs, 'Foreign Pass', for prepaid customers in India. Starting as low as Rs. 196, these voice call packs are available for most popular travel destinations and is aimed at offering travellers the convenience of keeping in touch with their friends and family instantly. For e.g. with these packs customers will now be able to make and receive free local calls and outgoing calls to India. Customers have the option of choosing from three affordable voice calling packs, starting at Rs. 196 for 20 mins, followed by Rs. 296 for 40 minutes and Rs. 446 for 75 mins. Extensive customer research by Airtel suggested a customer usually wants to connect with family/ friends upon arrival at a destination – these new packs have been designed to help address the problem of quick, short calls overseas without the hassle of buying local SIMs. Commenting on the launch, Vani Venkatesh, Chief Marketing Officer, Bharti Airtel said that we are delighted to announce the launch of Airtel Foreign Pass-convenient prepaid International Roaming Recharges to keep our customers connected and tension free, even when traveling abroad. Happy to share that Airtel is the first telco in the country to have designed these value offers for prepaid customers. We will continue to focus on innovations to add to customer convenience and delight. Activating these IR Packs is as simple as doing a recharge and customers can activate the pack through My Airtel App, or the Airtel website: www.airtel.in/ir in addition to walking to any of the nearest retailers. These recharge packs will be available to customers for the following 20 countries: UAE, Nepal, Bangladesh, Saudi Arabia, USA, Qatar, Kuwait, Malaysia, Singapore, United Kingdom, Srilanka, Bahrain, China, Canada, Germany, Australia, Hong Kong, France, Netherlands and Thailand. Airtel has already launched innovative and affordable postpaid International Roaming packs for all major countries across the world. These packs come with convenient validity options of 1 day, 10 days, and 30 days and offer loads of benefits including free incoming calls/SMS, calling minutes and texts both to India and the local country as well as data to stay online. Chandigarh 30th August:- To commemorate the 19th Death Anniversary of the founder President Pt. Mohan Lal Ji, the NSS Unit of GGDSD College, Kheri Gurna, Banur organized 4th Pt. Mohan Lal Ji Blood Donation Camp and Prarthana Sabha. The programme was held in the college campus in collaboration with Lions Club Chandigarh Supreme. The camp was inaugurated by Lion Sanjay Mehndi Ratta (President), Lion Archana Mehndi Ratta (Treasurer), Lion Harvinder Singh Khillan (Member), Lion Vijay Bhatia (Member) and Dr. Seerat, GMCH-32. College Principal Dr. Sunil Kumar Baria congratulated all the organizers for the successful conduct of the Blood Donation Camp. Dr. Maninder Kaur (NSS Coordinator) had been encouraging the students to come forward for this noble cause and the response was overwhelming. Eighty two units of blood were collected. Others who extended their help and support were Dr. Meenakshi Negi, Dr. Shivani Kaushal, Prof. Baljeet Singh and Prof. Swarn Singh. 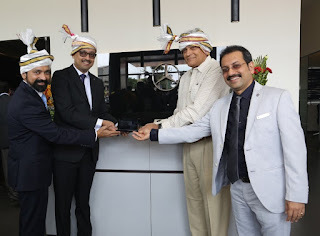 Coimbatore 29th August:- India's largest luxury car manufacturer Mercedes-Benz, bolstered itsservice network expansion in Tier II markets by inaugurating a world-class service facility in Coimbatore. Mercedes-Benz inauguratedone of its largest luxury service facilityby Sundaram Motors spread across an extensive area of 80,000 sq. ft.,in one of the fastest emerging markets in Tamil Nadu. The service facility is strategically located in the automobile hub of Coimbatore, which will serve as one-stop-shop destination for all customer service requirements in the region. 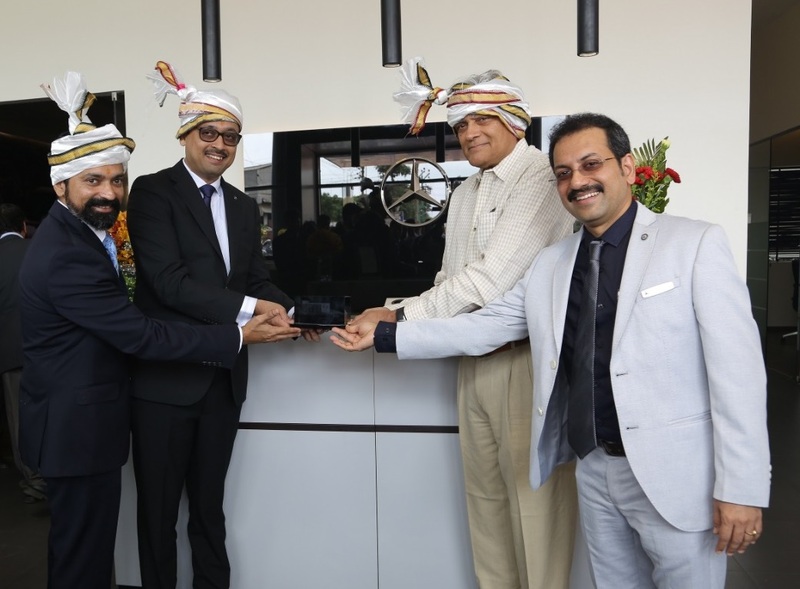 The facility was inaugurated by Santosh Iyer, Vice President-Customer Services and Corporate Affairs, Mercedes-Benz India and Sharath Vijayaraghavan, Executive Director, Sundaram Motors. Speaking on this special occasion, Santosh Iyer, Vice President-Customer Services and Corporate Affairs, Mercedes-Benz India, said that service differentiation has been Mercedes-Benz's key focus area and we are glad this strategy has worked well for the customers. A robust service network and multiple customer touch-points has allowed Mercedes-Benz to remain closer to the customer, resulting in delightful experience and loyalty.Our focus on emerging Tier II markets like Coimbatore, is going to play a significant role in our future growth story as we see these markets as key engines of growth.With 31facilities across 13 cities, South India remains one of our key markets and will witness continued network expansion and focused growth. Santosh Iyer further elaborated that Sundaram Motors has been our trusted partner for two decades, and has implemented multiple service initiatives that has helped in cementing customer trust in this region.We are now looking at strategically expanding in the Tier II markets by offering world-class service facilities, comprising unique luxury elements, the best of products and exceptional customer service. He added that our aim is to set the benchmark in vehicle ownership experience and be the Mercedes of Service for our customers. Facilities such as this, only reiterates our confidence in the market and in our investors. SharathVijayaraghavan, Executive Director, Sundaram Motors said that Sundaram Motors rolled out Mercedes-Benz's acclaimed 'My Mercedes, My Service' programme and today we take yet another step of strengthening our two decades old relationship with the Star. There is an increasing demand for Mercedes-Benz products in Coimbatore and adjoining markets and we are delighted to partner the growth of the brand in this emerging market.Our vision is aligned with Mercedes-Benz's philosophy of 'The Best Keeps Leading' and we are inspired to create customers for life with our superlative services. This is our eighth Mercedes-Benz outlet in Tamil Nadu and Karnataka region, and we are confident of adding many more in foreseeable future. The facility is built in tune with the global standards and aims to deliver a delightful, hassle-free experience to all its existing and potential customers in the region. The strategic location of the facility will not only cater to thisprosperous city but also to neighboring areas,helping the brand expand further. The service facility is one of the largest in India. It spans across a massive 80,000 sq. ft. with 26 service bays for preventive maintenance and body & paint. With an investment ofRs. 16 crores, the facility was constructed in a short span of 15 months. Located at SFNo.514/2A & SFNo.515/1a1, No.1/166 Pollachi Road, Eachanari Post, Coimbatore – 641021. The facility is a one-stop-shop for all the customer service requirements. Chandigarh 29th August:- City Beautiful is vying to be the most e-ready across India. City Beautiful's beauty will no longer remain confined to its physical beauty but is slowly seeping into the very fibre of the society that is sure to make the city even more livable than it is now. Chandigarh tops the country in Digital Payments Transactions on Per Capita Basis. Chandigarh scores 18.5 transactions per person and is way ahead of all states and union territories. Andhra Pradesh is at second position with 7.9 transactions on per capita basis while Maharashtra is at fourth position with 3.7 score and Haryana at number three with 5.5 score. This indicates how e-ready people in the city are and how receptive is the Chandigarh Administration in making services available online. To take the Digital India agenda forward, the Chandigarh Administration is organizing Digital India Conclave, in collaboration with Elets Technomedia Pvt Ltd on August 30 at Hotel Taj. The daylong conference will be attended by policy makers, industry honchos and senior administrators from all across the country. The Digital India Conclave will see participation from several states including Odisha, Maharashtra, Gujarat besides Punjab, Haryana, Himachal Pradesh and Rajasthan. The Conclave will be inaugurated by Finance Minister, Punjab, Manpreet Singh Badal and the Digital India Awards will be given away by Vijay Inder Singla, Minister of Information Technology, Government of Punjab. The Conclave will see presence of key officials from Chandigarh Administration including Jitender Yadav, Special Secretary IT, Harish Nayar, Special Secretary, Finance, Sachin Rana, Additional Deputy Commissioner besides Kamal Kishore Yadav, Commissioner Municipal Corporation. The theme of the conference is Digital India for Better India and the conclave will see several sessions including Smart Cities in the Era of Digital India, Leveraging Futuristic Technology for Good Governance: Challenges & Opportunities besides panel discussion on Transformation in BFSI Sector through Innovation: Ensuring Digital Economy in Digital India. Senior officials from Government of India, Ministry of Electronics and Information Technology will be attending the conclave to share their thoughts. 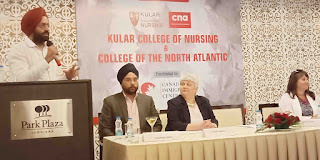 Ludhiana 29th August:- The Kular College of Nursing has inked a pact with a leading educational institute of Canada, the College of the North Atlantic (CNA), for students of nursing. The MoU was signed by Dr Kuldeepak Singh Kular Chairman of the Kular College of Nursing and Trudy Barnes, CNA's Vice President, International Corporate Training and Continuing Education, today. Dr. Kuldeepak Singh Kular said that this program would give a clear edge to the nursing students from the region as they would be trained according to the Canadian nursing practice standards and guidelines. He added that the students admitted to this program will undergo a six- week induction program in India and complete their degree at the College of the North Atlantic in Canada. Elizabeth Vincent CNA's International Business Development Manager, informed that experienced faculty from Canada shall be preparing the students during the six- week preliminary sessions to be held at the Kular College of Nursing following which the students will be eligible for admission to CNA for the May session. Dr. Kuldeepak Singh Kular said further that Nursing students with BSc, GNM and post-basic nursing qualifications are eligible for the program. The six- week program will be held at the Ludhiana campus followed by the two- year degree program in nursing at CNA in Canada. Chandigarh 28th August:- Hockey Chandigarh is Celebrating the National Sports Day under the guidelines of Hockey India on 29-08-2018, at Hockey Stadium, sec 42 Chandigarh at 04:00 Pm onwards. Exhibition Match will be played on that day between S.G.G.S.S.S, SEC- 26, V/s Chandigarh Hockey Academy. Chandigarh Sports Department will also be the part of National Sports Day Celebration 2018. Anil Vohra, Secy. General Hockey Chandigarh said that on National Sports Day, some senior dignitaries, Olympians and upcoming youngsters hockey players, Children of different School will participate in the Celebration. On behalf of Hockey Chandigarh, we appeal all the Hockey Sports lovers Chandigarh to come and join the Celebration of National Sports Day. Mumbai 28th August:- HDFC Life Insurance Company, one of India's largest private life insurers today announced the launch of HDFC Life Classic One, a single premium ULIP plan which offers the dual benefits of creating wealth through potentially high returns, along with financial protection in the form of life cover. Salaried as well as self-employed individuals sometimes come across a financial surplus. This could be in the form of a bonus, through maturity of a financial plan or a sudden wealth gain. Choosing the right financial instrument for investing a surplus of this kind can be difficult. There are very few instruments available today, which offer the flexibility to maximise gains from market movements, while also offering a life cover of 10 times of the single premium paid. HDFC Life Classic One has been specially designed to address this need. This product offers individuals the opportunity to invest in a market-linked plan through a single-premium payment and stay invested for the long-term. It provides policyholders with nine fund options across debt, equity and balanced fund platforms. This unique product also allows for unlimited free switches between the funds, thereby enabling customers to maximise their investments. The product suite of HDFC Life has products belonging to traditional, ULIP, pension and health categories, designed to meet the rapidly changing needs of Indian consumers. Each product is developed after a detailed research in terms of consumer needs, available options and the benefit of the product over the long-term. Chandigarh 28th August:- K S Bhatia, Founder & CEO of Pumpkart,com held a press meet at Press Club here. It is noteworthy that Pumpkart's strong brand pull & unique start up concept, prompted even Google CEO Sundar Pichai to hail & praise it in Silicon Valley in front of PM Narendra Modi at the 'Digital India'2015 summit. The uniqueness of Pumpkart.com is that it is the one & only online platform that offers an E Commerce business model in relation to water pumps, which were traditionally sold on the 'brick & mortar' retail store format. K S Bhatia who has a penchant for innovation, has now announced the formal launch of 'Pumpkart Services'-a vertical of Pumpkart, which will be providing after sales services across product segments . K S Bhatia said that we are collaborating with dynamic entrepreneurs of the region and giving them the advantage of the Pumpkart branding. Under these service franchisees, we will be giving after sales services for not just water pumps but all other home appliances. We have already inaugurated two such centres in tricity -one in Sec 45 Chandigarh and the other in Kharar . The third has been formally unveiled in Ludhiana. We envision to open 50 such centres by end of this year in Punjab , Haryana, Himachal, Delhi and J & K. This will be taken to 100 by mid 2019. It is pertinent to mention here that with this launch Pumpkart will emerge as the first E commerce company India, which will do supply as well as provide after sales services across product categories. Pumpkart, at present is operative in B2B module and has successfully established their white label brand Panatech . But keeping in mind the evolving technologies Pumpkart is revising the module to Supply chain management in B2B . Details of this were explained through a presentation by K S Bhatia. Under the new system Pumpkart no longer be just a water pumps supplier, it will be coming up with a wide product range in appliances, plumbing, hardware, sanitary products, electronics and entire industry supply et al. For this Pumpkart has started tying up with players in the branded & non branded space to give them a platform. The idea is to make them accessible to the consumers directly. At present Pumpkart has about 5000 retailers on board and wishes to take this figure to 25,000 by next financial year. The new thrust at Pumpkart will be supply chain management in North India and then this wil be taken Pan india. K S Bhatia, who is back from UN HQ where he was the lone Indian speaker among delegates from all across the Globe, in the Sustainable Development Goals(SDG) Summit, shared further that our supply chain model will convert unorganised business ventures into organised ones through technology & branding. The model we are getting will through technology, remove multi layers of middlemen like C & F agents, distributors & wholesaler. For achieving its goals in supply chain management, a state- of- the- art app has been developed by top technical experts which will run the new E Commerce model, & this will be accessible Pan India and will also have the feature of regional language so as to aid the clients. He said that Pumpkart has also roped in Kapil Dev as its Brand Ambassador. Chandigarh 28th August:- The prospective teachers of Chitkara College of Education were welcomed on the first day of their journey to become the alpha teachers by renowned psychiatrist and decorated Indian theatre & film artist, Padma Shri Dr. Mohan Agashe and Master Storyteller & Curriculum designer, Simi Srivastava. The prospective teachers were reconditioned on using Performing Arts as a classroom pedagogy restructuring tool through highly enriching and engaging sessions on "Bringing Theatre into Classroom" and "A Sneak peek into the world of Storytelling". Theatre and Performing Arts are powerful tools which not only engage with the creative side of the brain, they also provide an ideal balance in students' patterns of study. It's easy for children to become swamped in a sea of theory, which is why subjects that offer practical learning are essential to rejuvenate and reengage students, iterated both the speakers while sharing the objective behind conducting these sessions for prospective teachers. 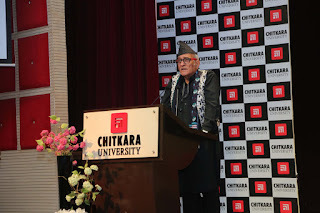 They also praised Chitkara University for developing such a powerful & revolutionary B.Ed. program which is in sync with the industry and caters to the demands of the present generation. Dr. Madhu Chitkara, Vice Chancellor, Chitkara University, Punjab shared the vision behind organising professionaly certified workshops and revamping of the B.Ed. curriculum at Chitkara University while addressing the audience that after thorough investigation and research, Chitkara University identified gaps in teacher education programs prevalent worldwide and thereby developed various modules of teacher education program which are more practical, meaningful and job oriented. The Innovative and revolutionary teacher education program offered by Chitkara University ensures a future teacher who is more digital, informed, aware, employable, global, hands-on, researcher and student-friendly in approach. Hence, this future teacher has been given the name "alpha teacher" who is capable enough to teach and groom the millennials and the digital natives born after 2003 and 2010. Chandigarh 28th August:- Usha International, one of India's leading household consumer durables company, proudly announces its association with Sui Dhaaga-Made In India produced by Yash Raj Films and starring Bollywood heartthrobs Varun Dhawan and Anushka Sharma. As the pioneers of sewing machines in India when they started in 1936, Usha International is today a leading sewing machine brand in India and offers a range of technologically advanced solutions to cater to a wide variety of sewing needs. Sui Dhaaga-Made in India celebrates and is aligned with Usha's philosophy of swadeshi and 'Make in India' through the heart-warming story of Mauji (Varun Dhawan) and Mamta (Anushka Sharma). The film showcases their passion and talent which progresses in life and creates a fashion label Sui Dhaaga–Made In India, reinforcing the fact that sewing in deeply entrenched across classes and masses in India and has the potential to bring about impactful socio-economic change in the lives of people who use it to further their passion and creativity. Usha sewing machines are an integral part of the film both visually and thematically. Talking about the association, Harvinder Singh, President, Sewing Machines & Appliances, Usha International Ltd, said that Usha is very proud to be associated with Sui Dhaaga-Made In India, a film that celebrates the entrepreneurial spirit that exists across India. The movie is in perfect synergy with our philosophy that sewing is a skill that anyone can learn and use to elevate their quality of life, and also serves as a powerful tool to mainstream the marginalized. We are definitely looking at this association to connect with the masses and bring to life the joy that comes with unleashing one's creativity using a sewing machine and, of course, the potential economic benefits that follow. It could be a person in a small town who wants financial independence or then a corporate leader who wants a creative outlet. Manan Mehta, Vice President–Marketing & Merchandising, from Yash Raj Films said that unarguably, Usha is synonymous with sewing machines in India for over eight decades so it was a win-win situation for both of us. Am happy to have Usha partner us in the co-marketing journey of Sui Dhaaga-Made In India. With innovative ideas for co-promoting the agenda of self- reliance and dignity of labour, Usha along with Sui Dhaaga-Made In India will endeavour to spread this message as far and wide as possible. Chandigarh 28th August:- Gaining massive popularity in USA as solo singer of Western music including Jazz, Pop, Rock, and Alternative, the San Jose-based 16-years old singer-lyricist of Indian origin Someya is all poised to make her entry into the Bollywood with her latest album " Gold ". What differ Someya's song albums is the fact that they are story-telling in nature thus keeping listeners engrossed to it with the tag of what next (?) attached to them. Someya plans to create a new musical era in India by entering into the Bollywood with the story-telling albums. Soon she will also start performing live all across India. In a release here, Someya said her Alt-Rock genre would be different from the existing ones in India as the Indian Jazz, Pop and Rock are not thematic in a sense as they do not tell original stories that have interesting plots. According to Someya, though a large number of international artists currently are exploring India as their musical zones, they are not doing something different which she plans for the Bollywood in particular and Indian music industry as a whole. This young American sensation who attended two years of summer programs at the prestigious Berklee College of Music, said that she is absolutely interested in exploring the Bollywood and Indian music industry by infusing into it my own flavor of western music. Growing up in California and exposed to Western music since she was a child, Someya who has already established herself in the USA with her story-telling Alt-Rock albums. The "Gold" is an example of it. It is story-telling in"Gold" that made it popular in USA. Though there are several rock-bands in India, they are concentrated mostly in Mumbai, Chennai, Bangalore, New Delhi, Kolkata and North Eastern states of India. The Alt-Rock, Someya says, has vast scope in India as the country has one of the largest numbers of youth population of the world. They would like story-telling ballad-type albums with adifference like "Gold". If the American youth liked the story-telling genre in "Gold", why would not Indian youth like them too? Questioning this, Someya said most of the Alt-Rock music has preponderance of Jazzy music. If stories are woven in such musical presentations that will evoke interest among the listeners as such stories would have the element of what next? This story-telling genre would certainly marks the beginning of a new Jazzy musical trend in India and the Indian youth would like them very much. Someya credits the story-telling in "Gold" that made its global acceptance. She said the Bollywood should focus more on Alt-Rock for the youth-centric movies to come. Asked to explain what story-telling Alt-Rock means, Someya said exemplifying "Gold"that a song would have mass acceptance if it revolves round a story. "Gold" is a love song that imagines a relationship with a perfect person. "Gold" alludes to various aspects of man-woman relationship including insanity in love, possessiveness-jealousy, unrealistic expectations from the partner, love, betray and passion. This sort of songs would ideally suit the Bollywood films revolving round the man-woman relationship. Someya said most of her music albums including This Flame, You Saved Me, This Flame, Intoxicated, When I Spoke Your Name, When I Am Not Around and I'am Not Coming were woven around a story. The stories enhance the intrinsic value of the song albums. Someya's next video is "Near Me". After that, she will be working on a major video production for an upcoming single, which is going to be one to keep an eye on as it will be cinematic and moving. Chandigarh 28th August:- Amway India, the country's largest FMCG direct selling company, has been conferred with the prestigious Asia's Best Employer Brand Awards 2018 in two categories - 'Best Employer Brand' and 'Award for Talent Management' at the 9th edition of Asia's Best Employer Brand Awards 2018. The award ceremony was hosted by the Employer Branding Institute, World HRD Congress & Stars of the Industry Group, with CHRO Asia as a Strategic Partner, and endorsed by the Asian Confederation of Businesses. The 9th Asia's Best Employer Brand Award 2018 witnessed a distinguished gathering of business leaders, jurists, academicians, economists and human resource consultants. An international jury comprising eminent stalwarts from the industry selected the winners from a pool of over 250 corporate houses after a rigorous evaluation process. The award was presented at a glittering ceremony held in Singapore and saw representation from across 30 countries. On receiving the award, Shantanu Das, Chief Human Resource Officer, Amway India said that at Amway, our endeavour has always been to implement best in class HR practices, and we are honoured to have won these esteemed awards. Amway has a robust talent management and development practice that creates an enabling environment to promote innovation and idea generation among employees and keep them at a competitive advantage. These awards are a reflection of our relentless efforts towards building a strong foundation of a people-centric organization and inspire us to work more devotedly. 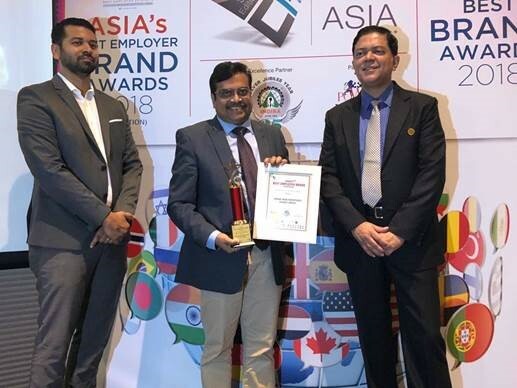 The 'Asia's Best Employer Brand' Awards recognize organizations and individuals across Asia who have excelled in building the employer brand. The award is conferred to those organizations that have a robust and effective HR and people management system, contributing significantly to Talent Management, Talent Development, and Talent Innovation. The well-defined five parameters for the selection of the winners included linkage between people and business strategy, innovation in people practices, penetration of HR initiatives, the impact of people processes on business & spectrum and impact of talent management practices. Chandigarh 28th August:- Jubilant FoodWorks Limited, one of the largest food service companies in the country, today announced the appointment of Kapil Grover as Chief Marketing Officer of Domino's Pizza. He brings with him a rich experience of 18 years and will be responsible for leading the marketing strategy for the brand. Speaking on the announcement Pratik Pota, CEO and Whole-time Director, Jubilant FoodWorks Limited said that we are delighted to welcome Kapil to the Domino's family. Kapil is a seasoned marketing professional with a proven track record of building brands and driving consumer relevant innovations. We are confident that Kapil will use his immense experience to deepen Domino's connect with its customers and to drive growth. The newly appointed Chief Marketing Officer-Domino's Pizza, Kapil Grover said that he is delighted to be a part of Domino's Pizza, the most loved pizza brand in India. The new role presents an exciting opportunity to lead the brand's endeavours to create a great pizza experience for the customers, strengthen the core delivery proposition and further expand its market share. I look forward to contributing significantly to its ongoing growth journey. Kapil Grover took over his new responsibility from July 2018. 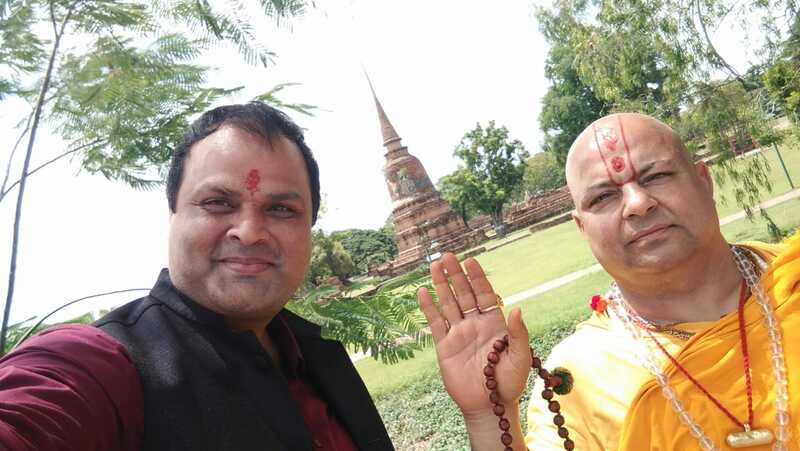 He was earlier associated with Burger King India as Chief Marketing Officer and have also worked with KFC India, Radico Khaitan and Luxor Writing Instruments in his past stints. Chandigarh 27th August:- Duniya re Duniya..Very Good Very Good, Duniya Wale…Very Bad Very Bad!! 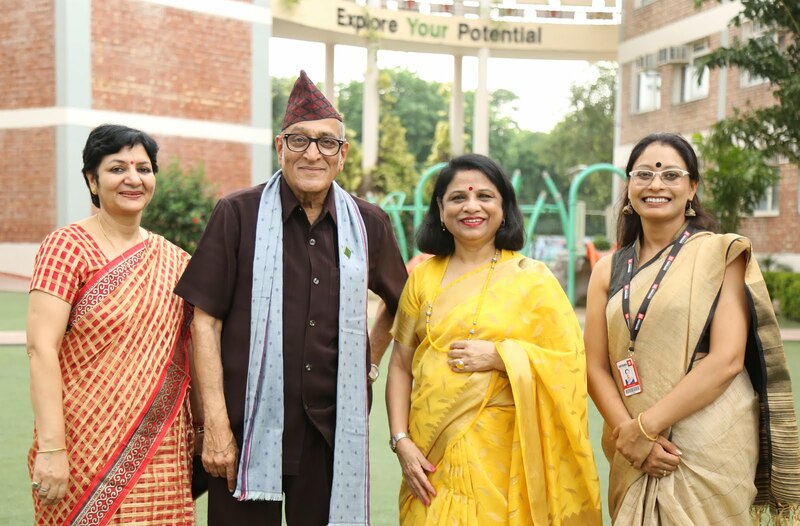 The famous song from the famous movie, Trimurti of a famous and decorated theatre Artist, Padma Shri Dr. Mohan Agashe who is here at Chitkara University to alter the DNA of prospective teachers of Chitkara College of Education. 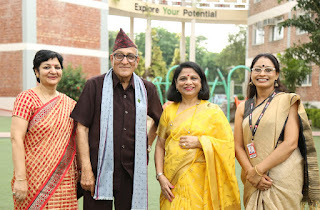 Dr. Mohan Agashe would enrich the prospective teachers through a session on "Bringing Theatre into Classroom" at Exploretorium, Chitkara University, Punjab. 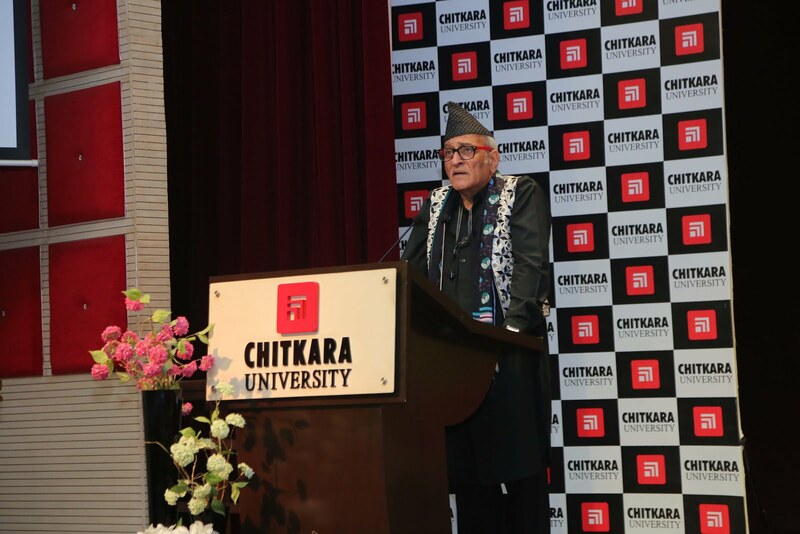 During a interaction with media Dr. Mohan Agashe said that theatre is a powerful tool. Theatre and Performing Arts not only engage with the creative side of the brain, they also provide an ideal balance in students' patterns of study. It's easy for children to become swamped in a sea of theory, which is why subjects that offer practical learning are essential to rejuvenate and reengage students. Hence, he is here to address the future teachers of Chitkara College of Education who are going to undergo a powerful B.Ed. program developed by Chitkara University which is in sync with the industry and caters to the demands of the present generation. Dr. Mohan Agashes' session has been conceptualized to welcome the prospective teachers who are going to pursue their Bachelors of Education program with skills which would initiate the altering of their DNA to become alpha teachers who are fully equipped to teach the digital generation. Dr. Madhu Chitkara, Vice Chancellor, Chitkara University, Punjab shared the vision behind Dr. Mohan Agashes' session and revamping of the B.Ed. curriculum, "After thorough investigation and research, Chitkara University identified gaps in teacher education programs prevalent worldwide and thereby developed various modules of teacher education program which are more practical, meaningful and job oriented. The Innovative and revolutionary teacher education program offered by Chitkara University ensures a future teacher who is more digital, informed, aware, employable, global, hands-on, researcher and student-friendly in approach. Hence, this future teacher has been given the name "alpha teacher" who is capable enough to teach and groom the millennial and the digital natives born after 2003 and 2010. Chandigarh 27th August:- VR Punjab concluded its two-month long Shop & Win Festival with the "Mega Draw". The festival gave Tricity shopping enthusiasts a chance to win some very grand prizes including the bumper prize a brand new Nissan Sunny . Shoppers who spent Rs 3000 or more at VR Punjab qualified to enter the draw. Speaking on the occasion, Jermina Menon, Vice President Marketing, Virtuous Retail said that the Festival was one in a series of events we have conducted with the objective of making shopping a lot more fun for our visitors. During this period, shoppers not only enjoyed great discounts at over 100 stores at the Centre, but also enjoyed a host of cultural shows. The Lucky draw has brought a lot of cheer for Chandigarh's Nikhil & his family. Little did Nikhil know that the Rs 7000 he spent shopping at the Central store in VR Punjab, will win him a swanky new sedan. Beaming with joy, Nikhil shared that it was a moment of excitement & joy for my family & me. Shopping at VR Punjab has always been an great experience, but winning a brand-new NISSAN SUNNY was beyond my imagination and is definitely a lifelong moment to cherish". Apart from the Mega Draw, there were a host of daily prizes that were given out over the course of the shopping festival. During the festival the overall vibe at the Centre was extremely celebratory and visitors are already looking forward to the next edition of the VR Punjab " Shop and Win." New Delhi 24th August:- Delhi's iconic Oxford Bookstore witnessed the launch of 'Silent Sun' by Ayushman Jamwal, the journalist and author's second poetry collection after 'Chameleon Lights' in 2016. The book explores the human condition in the modern era through different eyes of humanity, the constant and elusive search for meaning in the absence of the struggle for survival. Drawing from his experiences in the newsroom – Ayushman's vivid verses explore that human drive from the perspective of women (Am I Not God's Child? ), soldiers (May The Valley Hear Me Roar), refugees (We Remember, Our Nation Forgets), broken souls (The Cursed Rockstar) and even gods (Rama's Lament). The poems highlight that through turmoil and happiness, human beings want to achieve the realisation of their place in the world and the contours of their soul - donning the roles of creators, preservers and destroyers from time to time. Ayushman Jamwal and journalist Radhika Dutta discussed the author's journey to craft the collection. Other poets too took the stage to recite their favourite poems from 'Silent Sun', with many applauding The Cursed Rockstar, Ayushman's tribute to Linkin Park singer Chester Bennington who tragically took his own life in 2017. The interactive session was followed by musical renditions of the poems, with performances of 'I Think Of You' and 'The Lost Artist' to huge applause from the audience. Poetry is in Ayushman's DNA. He is the grandson of celebrated Dogri poet and Sahitya Akademi recipient – the late Group Captain Randhir Singh, also known as Kunwar Viyogi. He curates the 'Innovation in Art' initiative of the Kunwar Viyogi Memorial Trust founded in the memory of his grandfather, which gives a platform to budding artists and works towards preserving the Dogri language. Ayushman Jamwal said that Silent Sun celebrates the passion that elevates all of us to be a little more than nothing, and the array of emotions that fuel that passion. He added further that the Oxford Bookstore has given him an appropriate platform to launch the book and connected him to so many kindred spirits and like-minded souls to share his work and celebrate the power of expression. He hope people connect to Silent Sun and find their fire between the lines. Bangkok/Chandigarh 24th August:- Last few days back in the other holy land of Prabhu Shri Ram Ayuthaya(Thailand) where Mahant janmejay Sharan and Dushyant singh announced the construction and did the Bhumi pujan for Shri Ram Mandir the another signature for the people of Sanatan Dharam and crore of devotees. It's a very good news for every Indian but beside that the dark side of good work is they both are threatened by unknown people by abusive letters and death threats . The threat letter was found in Ayodhya Ashram the FIR is filed against this in Kotwali,Ayodhya, Uttar Pradesh. 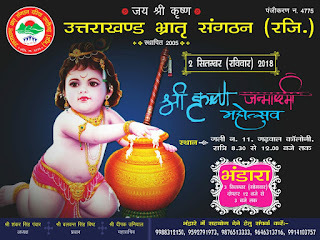 Mahant ji said he is unable to understand why people are doing this kind of rubbish things for every holy work and Dushyant Singh said that he is not afraid but it is very unexpected for him because it's a work of Prabhu Shri Ram and they don't even belong to any party or political leader this is the dream of Mahant ji and crore of Indians if anybody is having problem with it they can talk to us directly if not they are ready to face everything.